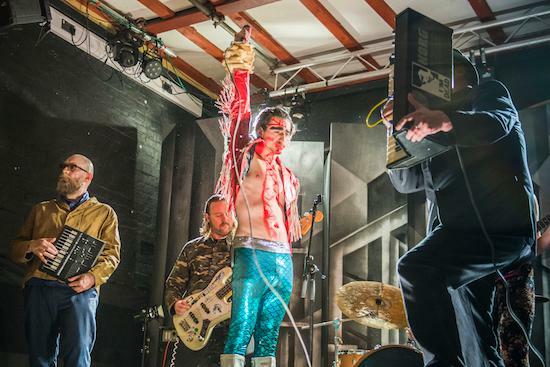 Featuring members of Fat White Family and the Eccentronic Research Council, The Moonlandingz originally began as a fictional concept and has since wormed its way into realisation. tQ are very happy to be involved in bringing them to The Trades Club in Hebden early next year, where they will be supported by Madonnatron and tQ DJs. You can get tickets for that show here. The show takes place on January 27. Described as “Joe Meek pop”, the band play on heavily stylised, tongue-in-cheek references to psychedelic rock tropes throughout their first, self titled EP released back in 2015. When asked by tQ if they expected the band to become as concrete a project as it has done, Adrian Flanagan said that “We didn’t expect ’Sweet Saturn Mine’ to blow up as it did, 6 Music played it every day for months.” Frontman Lias Saoudi of Fat White Family performs with the group under the moniker of Johnny Rocket.